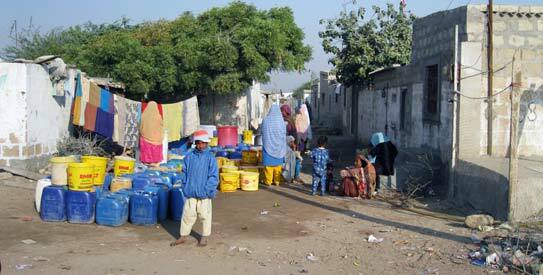 KARACHI: Lack of a continuous supply of water is one of the major problems the residents of Karachi have to deal with. An irregular supply of water to homes and industrial areas has also hampered socio-economic activities, resulting in slow or reduced productivity. Home to around 18 million people, the residents of the city require clean, safe water – fit for consumption. And a lot of it. What is more exasperating for the locals is that a solution to this critical problem remains low on the list of priorities for the government. Unfortunately, urban water supply has steadily gotten worse over the years. The current situation calls for creating awareness for, and promotion of, efficient use and conservation of water. Reports indicate that water is supplied to these hapless consumers is insufficient and contaminated, which is not fit for drinking. According to health experts, around 30,000 people, most of them children, die each year in the city due to consumption of contaminated water. The Karachi Water and Sewerage Board (KWSB) is solely responsible for municipal water supply and the management of waste water as well as sewerage in the city. To be specific, potable water supply, its bulk transmission, primary, secondary and tertiary distribution, enactment of tariff and recovery of revenues, operation and maintenance of the supply, disposal of waste-water as well as supply of water through tankers for emergency purposes are key components of the services extended by the KWSB. However, a decline in the KWSB’s institutional capacities to manage its aging operational systems, imbalance in the supply and demand, dilapidated water distribution networks, decaying pumping machines, soaring incidents of water theft and leakages in the supply lines, increasing dependence on water vendors and inappropriate as well as imprudent tariff structures are, among others, pressing problems which have created impediments in the overall performance of the KWSB. “Several solutions have been proposed in the past by water experts at different forums and conveyed to the government officials, but such efforts have failed for reasons unknown,” says Mumtaz Khaskheli, an expert on potable water and sanitation. “Recent changes initiated by the government such as the commercialisation of entire beaches, real-estate development and real-estate schemes along highways have also exerted an enormous pressure on demand for safe water. In addition, formal and informal settlements have also increased the demand for a continuous water supply,” says Gulshan Shaikh, a sub-engineer of the KWSB. Members of the Hisaar Foundation in Karachi, a civil society organisation involved in promoting the conservation of water, estimate that around 40 per cent of the water in the city is wasted due to leakages in the supply lines and another 25 per cent is wasted by consumers in form of leaky taps, washing cars, watering their gardens, etc. However, it is not just health problems that are associated with unclean water. “Lack of access to water for both domestic and drinking purposes has proved to be an additional economic burden on the earnings of low-income households. And this is so because they usually end up paying 12 times the price for drinking water than what people from higher-income brackets pay,” claims a member of the Hisaar Foundation. “We haven’t been getting water through the official supply for many years, although I regularly pay the KWSB water tax,” complains Ameena Batool, a housewife from eastern Karachi. In order to meet the daily water needs of the household, she pays about Rs 500 – 600 a week for water from a tanker. Because of poor maintenance, the municipal water supply and related facilities have become grossly inadequate with regard to users’ needs and expectations. Dwellers of the low-income group areas and katchi abadis, who cannot afford to pay the cost of private tankers, have no choice but to consume sub-soil, unhygienic water. “The operators of private tankers have taken undue advantage of the situation and have increased their rates; we pay Rs1,200 for a 1,000-gallon tanker and Rs 2,000 for a tanker carrying 2,000 gallons of water,” claim several residents across the city. And it isn’t just the residents are suffer from the water shortfall, industries have suffered just as much. Haji Ahmed Raza owns a large chemical factory in the Korangi Industrial Area. According to Raza, industrial units are forced to buy from water tankers on a regular basis to meet the demands of the factory. He also claimed that these water tankers have capitalised on the current shortage. Officials in the KWSB stated that there are currently around 150 illegal hydrants drawing water from its main pipelines which are not just a major reason for an acute water shortage in the city, but also causes a massive revenue loss of over Rs 1.3 billion annually to the water board. “A large number of illegal hydrants have been set up in different parts of the city, which is where a large-scale theft of over 30 million gallons of water occurs each day from the KWSB’s various pipelines. This is mostly done in connivance with low-ranking staff of the KWSB and the concerned area police,” a senior KWSB official said, who preferred to remain anonymous. Describing the private hydrants and tanker business as a ‘roaring business’, an engineer (bulk water) at the KWSB, claimed that around 30,000 ‘illegally-operating’ tankers [of 1,000 gallons each] were earning around Rs 4-5 million daily. “Since the private hydrants and tanker mafias are stealing water from the KWSB pipelines, the utility is losing an estimated Rs120-150 million every month,” he said. Some officials in the KWSB, however, believe that much of the water supply and demand can be met if the current water supply and sewerage infrastructure is revamped. “The water transmission and distribution lines were mostly installed during the ’60s and ’70s, and have completed their designed life. Replacing such lines that are faulty, will help reduce water wastage,” remarked a spokesman of the KWSB. However, the current water shortage is also due to the performance level and financial strength of the KWSB which has deteriorated consistently over the years. Corrective measures have been taken at different points in the past to fix the operational, institutional and water-supply capacity problems of the KWSB, but such measures have been rejected by some unscrupulous elements, recalled an official at the public health engineering department of the Sindh government. “Foreign multi-lateral lending agencies introduced various reforms, but they failed to meet the stipulated objectives. Some of the proposed approaches aimed at improving the KWSB’s institutional performance included the privatisation of the utility and subsequent institutional reforms,” he said. The official, wanting to remain anonymous, recalled how the ‘Private Sector Participation’ (PSP) strategy which was introduced in 1995 to make the KWSB economically, functionally and managerially viable and sustainable, was put on the back burner due to resistance within the organisation. “In 2005, technical assistance was also sought from the UNDP under the World Bank’s Water and Sanitation Programme for South Asia (WSP-SA) and even a consultative process was initiated to identify and address the pressing issues faced by KWSB. But matters were left halfway because of the then Sindh government’s apathy,” claims a senior planning official in the provincial finance department. Water experts say that at a time when fresh water resources are fast depleting and its availability to the people plummeting, revamping the KWSB and the way it functions as a whole is the need of the hour. The replacement of the water supply infrastructure in the metropolis and adjoining suburbs is equally critical for conservation and an efficient use of water.